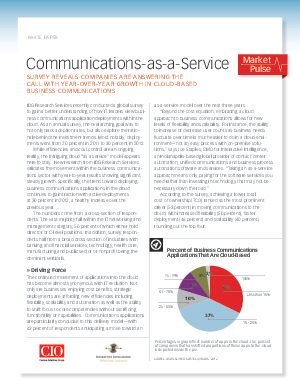 According to a new survey from IDG Research Services, more IT leaders are turning to the cloud "as a service" model to deploy businesses communications applications. And they're doing so in a number of industries, at an increasingly significant rate. Read the survey's findings, and the rationale of IT leaders for choosing the cloud, in this CIO Market Pulse white paper sponsored by Interactive Intelligence.